As mentioned yesterday, I've been quite busy cooking for Passover. And if I do say so myself, everything turned out according to plan, which is not always the case with new recipes. At last night's Seder, I unveiled the Matzo stuffing and the chocolate covered, butterscotch Matzo, while tonight I debuted my aunt's suggested, Matzo Kugel. I think that all of the dishes turned out yummy, but the chocolate/butterscotch Matzo reigned supreme in appearance and taste. 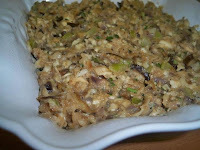 Matzo Stuffing - I was intrigued by this recipe from Bon Appetit, which called for a nontraditional ingredient, dried shiitake mushrooms. Instead of the dried, which were too expensive, I substituted regular shiitakes and they worked perfectly. Overall, the stuffing was flavorful and tasted like real stuffing--you wouldn't know that it was made of Matzo because it soaked into the chicken broth and expanded nicely. 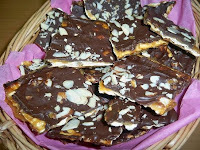 Chocolate Covered Butterscotch Matzo - What an easy recipe! I couldn't believe how user friendly and accurate it was. The only thing that you have to be careful with is to put plenty of parchment paper under the Matzo in order to separate it easily. Unfortunately, I didn't have this and struggled taking aluminum foil off of my sticky Matzo. However, the schmutz on my hands was completely worth it, after listening to the rave reviews of my friends and family. Matzo Kugel - Talk about fussy, I had to start making this two days ago, when I soaked a whole box of Matzo between wet paper towels and let it sit overnight. It was cool to see how the Matzo expanded and almost doubled in size. Then last night, I mixed all of the ingredients together and again, let it settle overnight. I woke up early to bake this thing and needless to say, I made a lot of sacrifices to get it on the Passover table. Once again, it was worth it, as my family was impressed. The Matzo took on a different consistency, tasting more like noodle pudding. 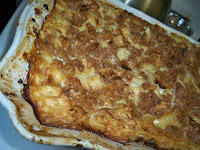 It was sweet, cinnamony and comforting--everyone seemed to appreciate the contrast that it brought to our Passover meal. oh man. these all look amazzzzzzzzzzzzing!